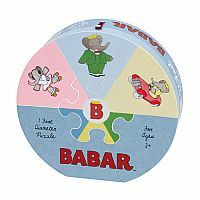 Six colorful pieces fit into a central hub to form a 1 foot diameter (30.5 cm) puzzle in Mudpuppy's Babar Deluxe Puzzle Wheel. The pieces are extra thick for small hands and fit neatly into a rounded, hinged package with a button and elastic closure. As an added bonus, the reverse of the puzzle forms a color wheel, and the package is decorated wtih foil accents. One side of the package is flattened so it can stand upright for display. The beloved King Babar and his elephant family were illustrated by Laurent de Brunhoff.